A voluminous blowfish sashimi appetizer is followed by two self-selected main courses, including both beef and pork dishes. Even non-Japanese can enjoy them with ease. This is a combo for lunchtime only. It is a bowl of chicken and egg on rice made with Oyama (brand-name) chicken, and Okukuji (brand-name) eggs. The combo includes miso soup and dessert. This is a luxurious lunchtime menu which uses sablefish so thick it can stand on edge. It goes exceptionally well with freshly cooked rice. Served with miso soup and dessert. Listed course prices are per person. This is a blowfish hot-pot course perfect for people who want to enjoy their meal unhurriedly, at their own pace, without any staffers attendant. In addition to blowfish sashimi, the main dishes, from which you can choose in accordance with your tastes, include beef and pork. Even non-Japanese can enjoy them with ease. Besides voluminous blowfish sashimi,” the main dishes, from which you can choose two kinds, include beef and pork. Even non-Japanese can enjoy them with ease. 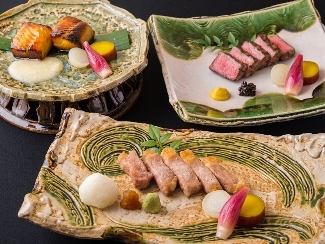 A veritable feast, this course includes blowfish sashimi, fried blowfish, a blowfish hot-pot, a porridge of rice and blowfish and a main dish, of which you can choose from four kinds, including wagyu (Japanese beef) steak and charcoal-grilled Iberian pork. This is a luxurious course made up of all kinds of blowfish dishes: blowfish sashimi, fried blowfish, jellied blowfish broth, a blowfish hot-pot, and a porridge of rice and blowfish. You can enjoy any of the blowfish courses mentioned above with a more luxurious natural globefish used in them.